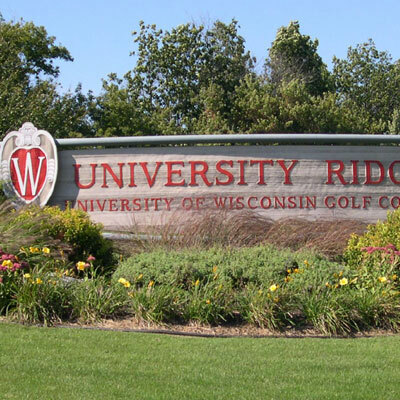 University Ridge Golf Course is a public, 18-hold golf course located in Verona and operated by the University of Wisconsin-Madison. It is the home course to both the Badgers men's and women's golf teams, and host to the PGA Champions Tour American Family Insurance Championship. The 225-acre tract offers a spectacular view of the rolling terrain, with deep-set woods, hills, sprawling meadows, and a natural pond and prairie. The 33-acre practice facility features: a short-game practice area with bunker, two 9,000-square-foot hitting areas, bent grass tees and greens, and colored flags for distances. The Ridge was selected as the nation's third-best campus course by Golfweek in 2015.